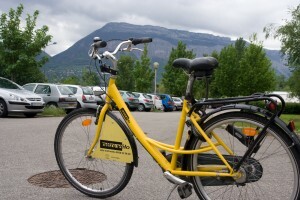 Grenoble is incredibly flat despite being surrounded by mountains and the fact there are so many cycle paths makes cycling an excellent way to get around the city. K had hired a Metro Velo which I promptly borrowed off him and so I able to cycle round for free. The bikes are very cheap to hire. He got it for €35 for 3 months although he did have to leave a €90 deposit. The bike was in super condition and came with a lock and lights – all it needed were some panniers and I’d have been over the moon. Click on the photo to have a look at the rest of my Grenoble photos. This entry was posted Monday, May 10th, 2010 at 10:46 am	and is filed under Cycling, Things to do. You can leave a response, or trackback from your own site.